The amount of different devices that combine things that at a glance seem to be unable o group is growing daily. Some hybrids are so exotic, that they become too singled out once they hit retail sale and fail to gain any impressive results, meanwhile others are to the contrary: popular and get developed in future. 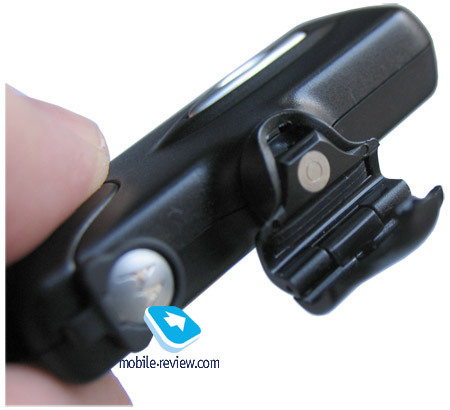 The handset that we are going to review in this article belongs to second type of exotic devices. 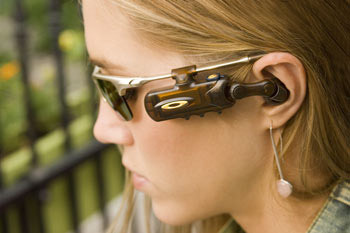 A headset combined with sunglasses from Oakley. This company became one of the first that started releasing “wearable electronics”, by maximally simplifying this kind of products, so instead of looking futuristic, it became utilitarian. 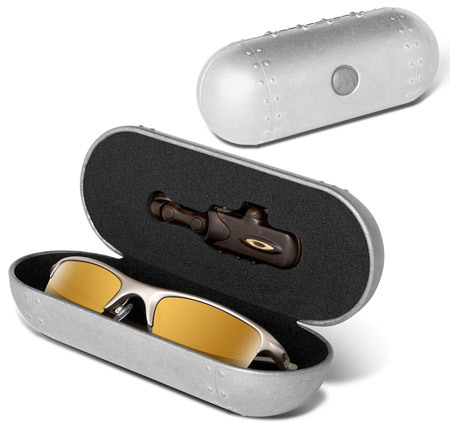 A model of sunglasses with built-in mp3 player was kind of expected, but only Oakley was able to make it a true class. 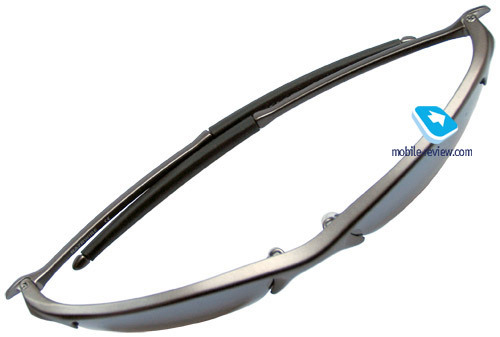 The brand became very popular, and after it gained recognition for making advanced lenses, rims and glasses. Addition of electronic component did its task: the novelties became extremely popular, and the current newborn market today lacks competitors. 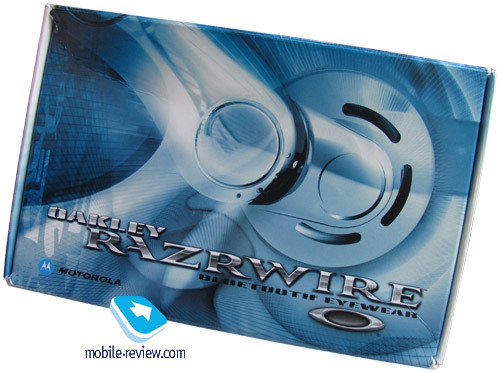 Model RAZRWire is the first one among Bluetooth-headset series, as you can see from the title, the marketologists were trying to replicate success of RAZR. It turned out that we had this model back in the 2nd quarter of 2005, but lack of sun it was hard to see what it truly is about. I can easily see a man walking in sunglasses with blizzard blowing into his face and darkness covering the surroundings. Once we waited till spring sun, we were able to test this product, but I would like to point out, that I wanted to tryout the glasses myself, though I was unable to do that due to problems with eyesight (contact lenses would be required). On the other side, adjusting to contact lenses after unsuccessful experience I had before wasn’t what I wanted to do. The solution for this problem was rather easy and elegant: sunglass construction allows replacing lenses, so I did (sun glass was replaced with sun glass with dioptre), even though this operation looked rather blasphemy. Original lenses include a lot of different technologies, they provide really good visibility and don’t flare (tested on those who do not have problems with their eyesight). 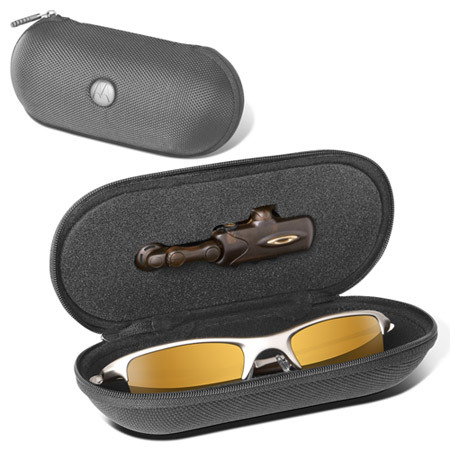 Lenses in this model are sort of limousine on the market, once you get used to them you will not be able to wear other sun glasses. 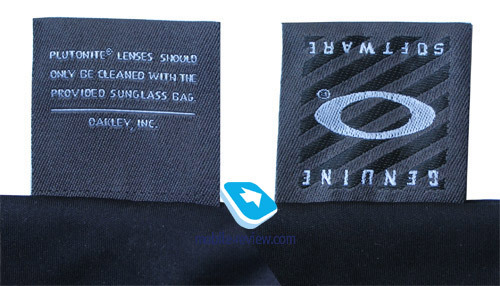 Those who want to read more about the technologies used in these sun glasses should visit manufacturer’s web-site (www.oakley.com), there’s a lot of information to read. The casing is very light, it weights around 22 grams. The material used is lighter than titan by 40% and is not cede to it in durability. The design is not so varied, there is only one edition in three colors (black, grey and golden). The headset will have the same color. miniUSB cable is included in the package, this is how you will charge up your headset. There’s also soft cover included. Plutonite lenses can be wiped with this cover, it has been noted in the manual that using other methods can damage them. 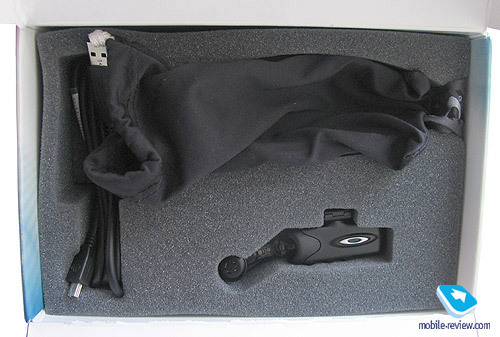 Another important aspect of the package is the headset itself. 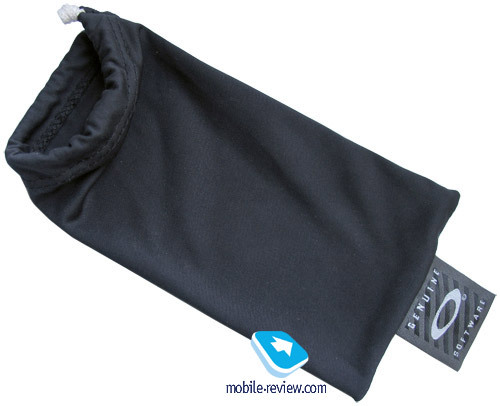 Those who are afraid of crushing the sun glasses inside a bag, or want to protect them the best possible way, can choose between two kinds of additional cases: soft one and hard one. They cost around 30 and 45 dollars correspondingly. There’s place for both sun glasses and the headset. Technical specifications of headset do not blow one’s mind away, this is atypical headset in a not typical presentation. The block weighs 15 grams, which makes it 37 grams when combined with glasses. 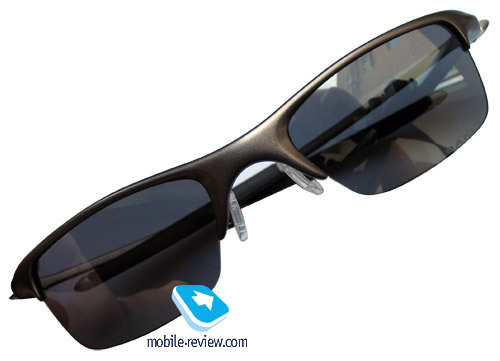 It’s slightly heavier than ordinary sun glasses in middle-sized casing and without bloomed lens. The headset can be worn on any of the two ears, the one on the right and the one on the left. It’s only the location of buttons (either on top or in the bottom) that will change. 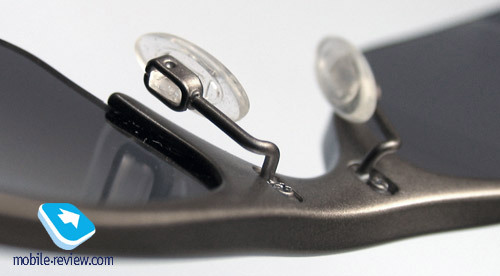 In order to open the clip, you just have to rotate the headset by 90 degrees, just like in case with sun glasses. This is convenient. The headset is safely locked on the ear, and you can move it from side to side in case if it’s needed. While riding a bicycle or running on the street, the headset will not fall down from the ear, it is locked safely. In many respects this product is targeted for those who are living in active way of life. There aren’t compatibility problems with different phones, handset looks with Motorola phones as well as with others. The bounding process takes little time, Headset, Handsfree (Bluetooth v1.2) profiles are supported. The manufacturer also states that the built-in battery provides up to 100 hours in stand by mdoe and up to 6 hours during phone calls. Considering the fact that many people will use this headset while driving their car, or bicycle, or any other similar activity we can say that the stand by time does not influence perception of the headset, it’s not that important. The sound quality is good. The headset supports all standard functions, you can dial last number, mute sound during phone call, use voice dialing (depends on your phone). Unfortunately, the headset is missing preset ring tone, this is just an ordinary one, and that’s it. Due to the fact that headphone stalk has several articulations and it can be leaned vertically – it becomes easy and convenient to place it into one’s ear. It is very comfortable and fits nicely. 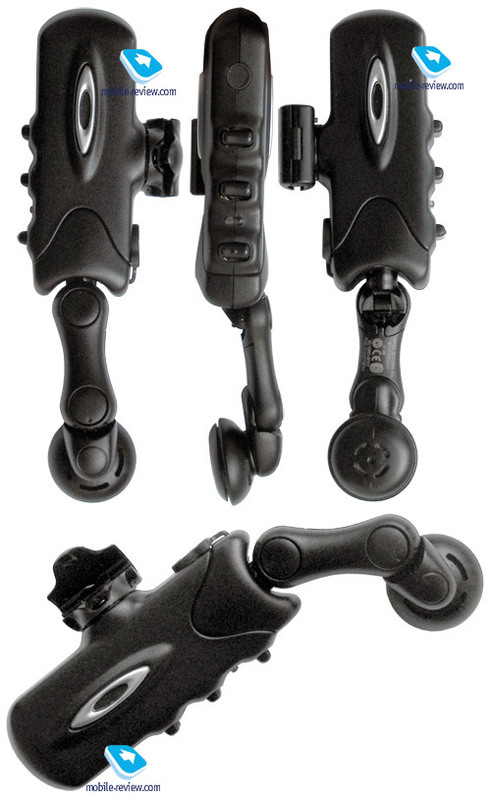 The overall impression from this product remains extremely positive. Of course not everyone will find the shape attractive, it will not fit everyone, but their realization however deserves praise. Considering the fact that the price was lowered to 245 for all counties (in Russia the price remains at 300 USD mark), the model looks too expensive. On th other hand the sung glasses themselves are pretty fashionable, but presence of headset adds weight. Targeted auditory will be interested in this product, it has big potential. 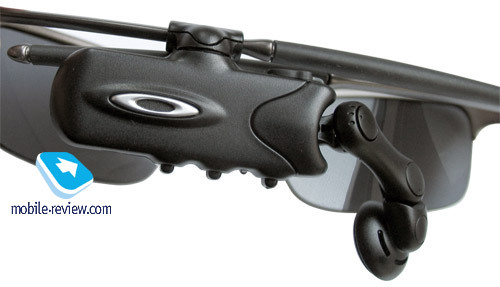 In near future we will tell you about the next product – O’ROKR Oakley, here the headset has two headphones and allows listening to music.